I can’t help but wonder if Allan Zadoff was a little frustrated that the title I Am Number Four - because this would work brilliantly with I Am Number Five I think -has been taken and if it’s part of the reason behind the changes. From The Lost Mission to I Am the Mission, the second instalment in The Unknown Assassin encourages paranoia, a little bit of nail-biting and hair-tearing and maybe one episode of explosive cussing on my part. 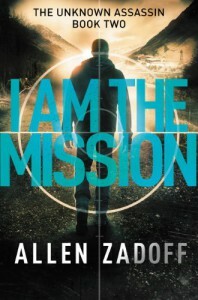 Set shortly after the events of I Am The Weapon, the assassin now known as Daniel is deployed by the program to complete the lost mission to kill Eugene Moore. Moore is a former US military officer currently leading The Liberty Camp, an extremist military training camp for the youth within the New Hampshire mountains. He has been targeted before by the program and lost an operative in the process. It is up to Daniel to complete the task with one specific condition set by his superiors: he cannot enter the camp. Through unforeseen circumstances, he of course enters the camp where he meets Moore and his family and gain an understanding of the philosophy he’s fighting for. What he discovers leads him to question the mission and, more importantly, his allegiances. More than the adrenaline-pumped thrill, the more mature themes of loyalty, family, patriotism and all that which makes us human delivered in the stark, droning monotone of our narrator, what I liked most in this book is that there’s a clear direction as to where Zadoff wants to take Boy Nobody’s story. When I realised this was going to be a series, I was a bit concerned that it will take the “Villain of the Week” course where it will take endless filler books before we get to the essential questions: What is the Program? And what happened to the assassin’s father? In terms of the bigger story arc, this didn’t disappoint in the mileage it covered. This was a little more political compared to the first instalment which cannot be helped seeing as the mission involves a radical idealist group. I didn’t mind it much though I would’ve liked a bit more development in Moore’s character. I kept feeling this aims to make him out like Ed Harris’ character in The Rock, and I kept waiting to find that complex charismatic zealotry, that misdirected patriotism borne out of frustration from the system that would make me believe intelligent and rational people will be convinced to leave the comforts of their lives to willingly follow his radical ideologies. It takes a certain kind of character to make that happen in a particular climate of discontent and disappointment, Eugene Moore was a half-baked version of it and I’m not sure the circumstances was built believably enough to pull it off. One of the issues I had with I Am The Weapon was in it’s heroine, Samara. She was still a background presence in this one, a pervading regret and sadness in The Weapon’s thoughts, but a new femme fatale comes in to the picture, Moore’s daughter Miranda. I quite liked the potential in Miranda’s character but I grew to become more and more disappointed in how it became apparent that she’s just there for the hero to kiss and so that “breasts” can be factored in a least one scene. So that we won’t forget that The Weapon is an attractive, virile young man, because James Bond made up all these rules and now we’re stuck with it. In truth, I enjoyed the chemistry between The Weapon and Francisco better, and with Howard the computer geek from book one, the best. But any of the Howard-archetypes in these kinds of stories always come out the fan-favorite so that’s hardly a surprise. Before I can stop him, Howard rushes forward, squashing me in a bear hug. Awkward bromance is best romance. The build up was a little sluggish and I found my mind wandering in the early half, a bit bored by the robotic storytelling which didn’t bother me in the first book but starts to feel tiresome the second time around. But in the end this managed to use that to the story’s advantage, providing the necessary contrast in the twists that it chose to take. The resolution felt a little rushed, the ending an ellipsis rather than an exclamation point. But the shift from relying heavily on the “novelty” of a young assassin to one that focuses on the conflicts the concept of a human perfect soldier entails was much much more interesting. Not much of a departure from this series’ attempts in putting a YA spin to the Jason Bourne archetype true, but in terms of fun and adventure, Zadoff pulls it off with enough street-cred for me to set a side the book I’ve been waiting for all year just so I can finish this and finally take that exhale I've been delaying from page one. Review Copy courtesy of the publishers. Quotes taken from uncorrected proof.